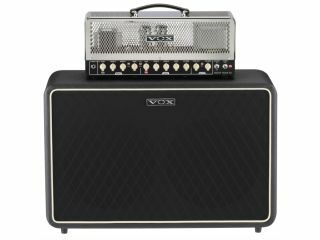 NAMM 2011 PRESS RELEASE: Announcing the newest member of the Vox Night Train family: the Night Train 50 This powerful, all-tube head offers two channels for traditional and high-gain sounds. Also available is the V212NT cabinet; a perfect match in both looks and sound. The Vox Night Train Series projects a powerful personality with its mirror-finish metallic exterior and serious all-tube sound. Now welcome our new 50 Watt model: the Night Train 50. Unlike the existing Night Train (15W) model - or even the AC15 and AC30 Custom Series - the Night Train 50 features EL34 tubes in the power stage, producing a powerful high-gain sound. Of course, the Night Train 50 also covers the traditional VOX sound, and its rich array of sonic variation makes it such a great and versatile choice for so many guitarists. The Night Train 50 features an all-tube, Class AB amplifier design delivering 50 Watts of power. The preamp stage is equipped with four 12AX7 vacuum tubes; two EL34 pentode power tubes. This unique tube complement allows the Night Train 50 to capture the traditional Vox chime sound, as well as creating a powerful high-gain sound that will revolutionize your ideas about Vox amps. The Night Train 50 features a two-channel design. The BRIGHT channel provides the inimitable Vox chime sound; the high-gain GIRTH channel utilizes an extra pre-amp tube for more crunch. The Night Train 50 will more than satisfy the guitarist seeking a versatile amplifier, and can meet the demands of a broad range of musical styles and playing techniques. Each channel offers Bass, Middle, Treble, and Gain controls for sculpting your sound. The BRIGHT channel provides a THICK mode that bypasses the EQ to boost the gain and make the sound even thicker. The Master section includes the traditional Master Volume and the Vox Tone Cut control, plus a new TIGHT switch. The TIGHT mode applies to both channels; it attenuates the low-frequency range to tighten the low end, providing even more sonic possibilities. An optional Vox VFS2A footswitch is available. With it, you can switch between the GIRTH channel and the BRIGHT channel as you play. This switch can also be used to turn the BRIGHT channel's THICK mode on and off in performance, vastly increasing the versatility of this single amp in performance by giving you three distinct voices. The Night Train 50 provides a convenient FX loop for adding your favorite effects. The FX loop (-10 dB) is true bypass to keep your tone intact. We've created a dedicated speaker cabinet that's the perfect match in sound and appearance for the cool-looking mirror-finish Night Train 50. The two 12-inch G12 Anniversary Model speakers were specially manufactured in commemoration of Celestion's 70th anniversary, and are a great choice for delivering the NT50s distinct clean and crunch tones. The V212NT's retro look and rounded corner design make it the perfect companion for the Night Train 50, exuding a powerful presence on stage.